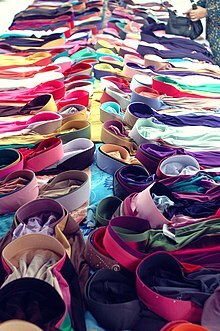 Variety of tudongs (tudung) sold in Malaysia. Tudong (also spelled tudung) is a Malay word, literally meaning the noun "cover", which is commonly translated/referred to as veil or headscarf in English. In Malaysia, Singapore and Brunei, the tudong is worn in accordance to Islam's hijab. Usually, the tudong covers the hair, ears, neck while leaving only the face exposed. It is part of the standard dress code for offices, such as school uniforms and formal occasions. In Indonesia, a tudung is a form of hijab that has a sewn-in curved visor. In Indonesia the word more analogous to the Malaysian word tudong is "kerudung" or "jilbab". (in Malay) "Tudung, hijab dan… — Aisha Adam" (Archive). The Malay Mail. 16 October 2015.